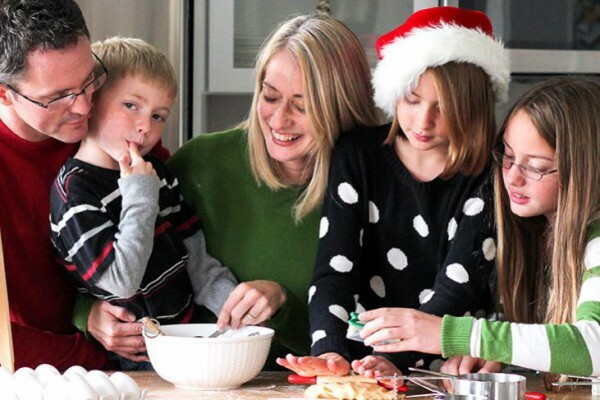 Let Brittany show you how to throw an adorable Elmo Circus Party! 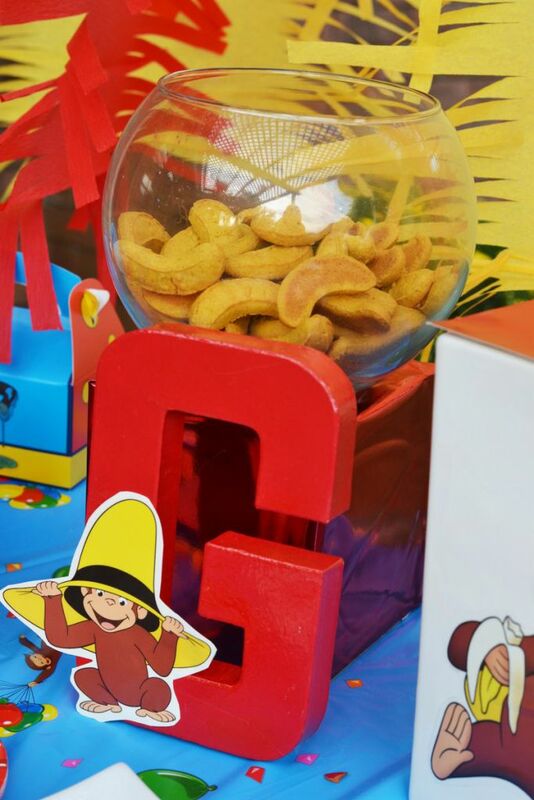 Or take a peek at a different Curious George party design! 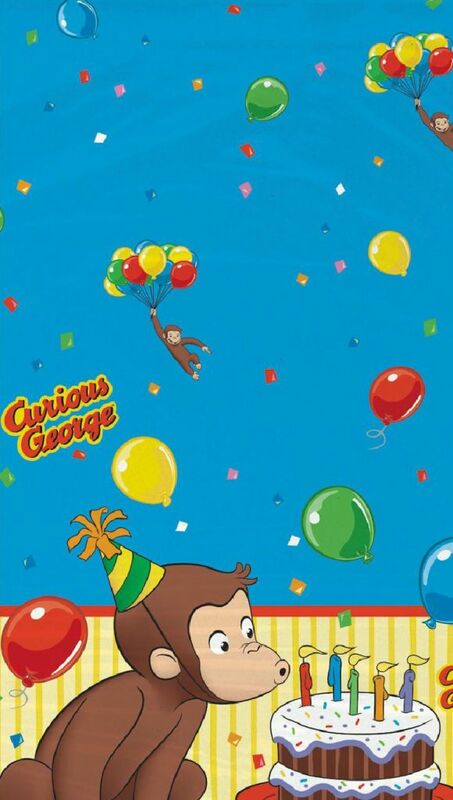 Curious George is a classic character in children’s literature. Kids seem to fall in love with him throughout the generations. 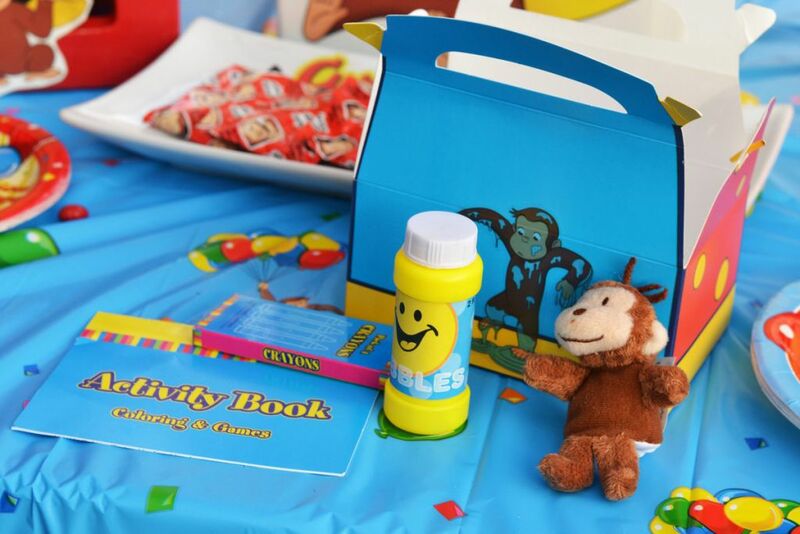 Boys and girls alike love to see what trouble Curious George is getting into this time! He’s always monkeying around! 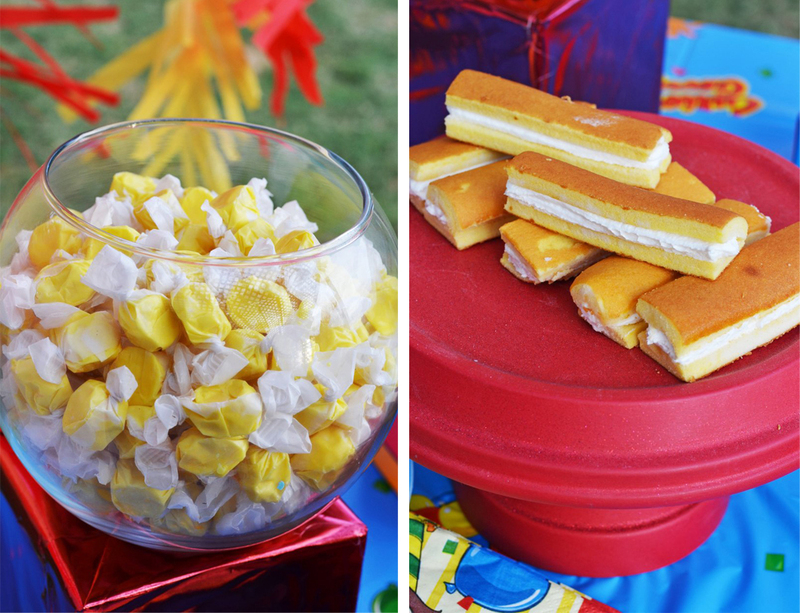 This party collection is so fun, and with a primary color palette of red, yellow, and blue, this theme is perfect for 1st birthdays! 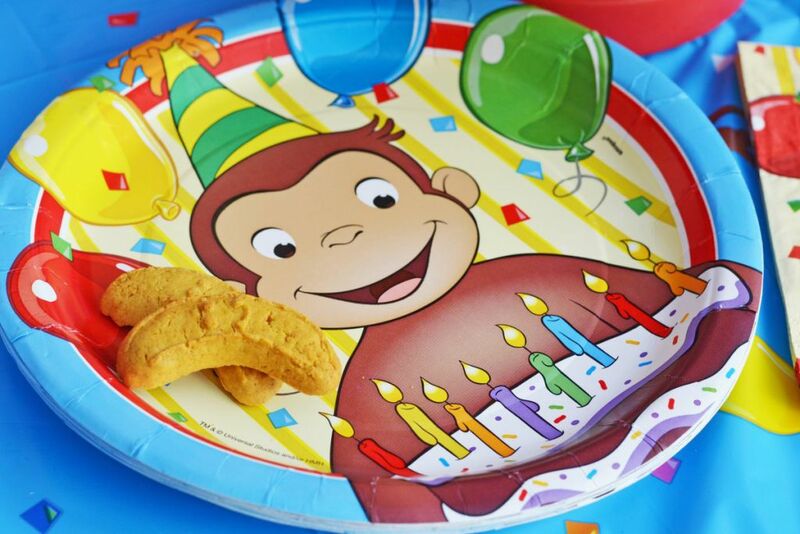 Today I am going to show you how to throw your own Curious George party using only Birthday Express party items and store bought treats. 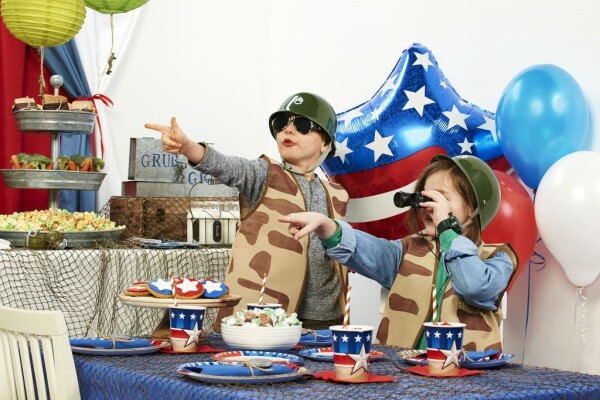 You can throw your own party on a budget and still give it a lot of style! I started my party with these big crepe paper twirls. You can buy large crepe paper in sheets online and all you do is cut fringe into the ends. It makes a big impact and you can do it in any color. It blows in the wind and makes for a really colorful and fun backdrop for any party! 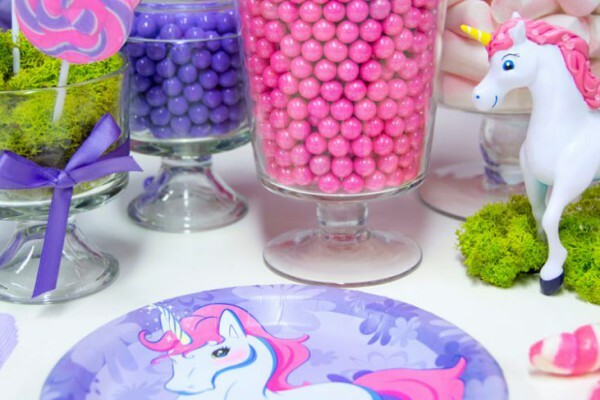 This is such an easy and inexpensive way to add a fun pop of color to your party! 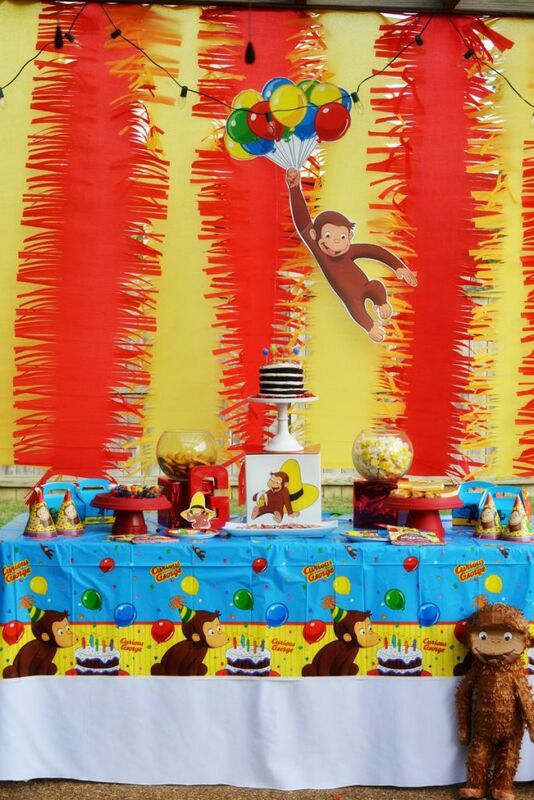 I used this cute and fun plastic Curious George tablecover to top my table. I based my cake on the design of the partyware. In the plate design and on the tablecloth, George is eating a chocolate cake with white icing. So, I made a layered chocolate cake and, left it “naked” and then iced it with white store-bought icing. I added some sprinkles and then these cute balloon candles to the top. 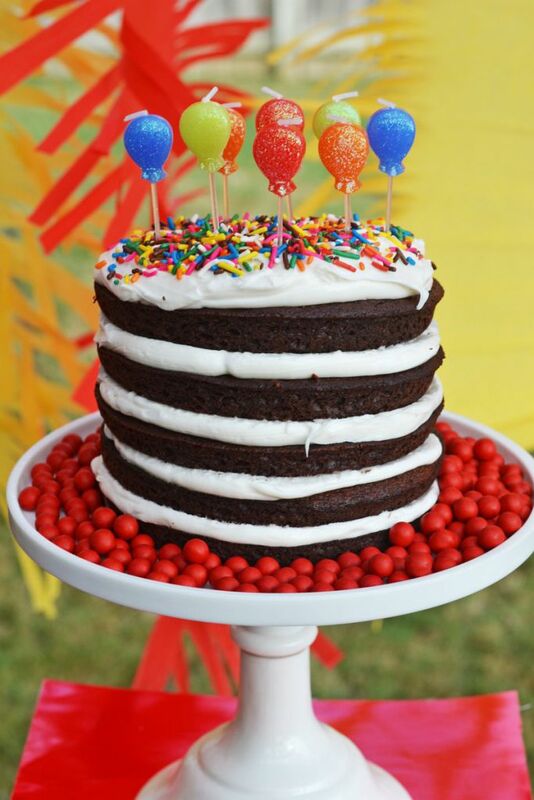 You can make a cute and delicious cake for all of $10! 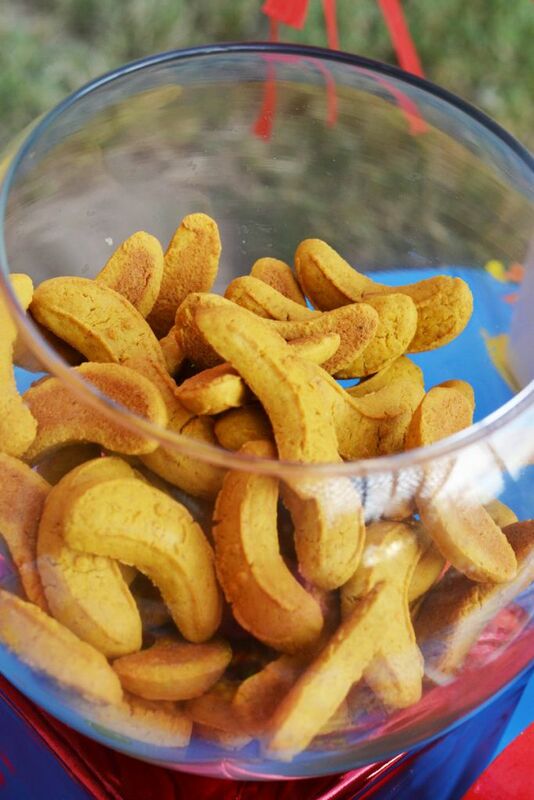 For the other treats, I bought these little banana cookies from the baby section. They are marketed to babies, but they are delicious to kids of any age! I also added banana taffy and these cute little “Banana Twin” cakes. 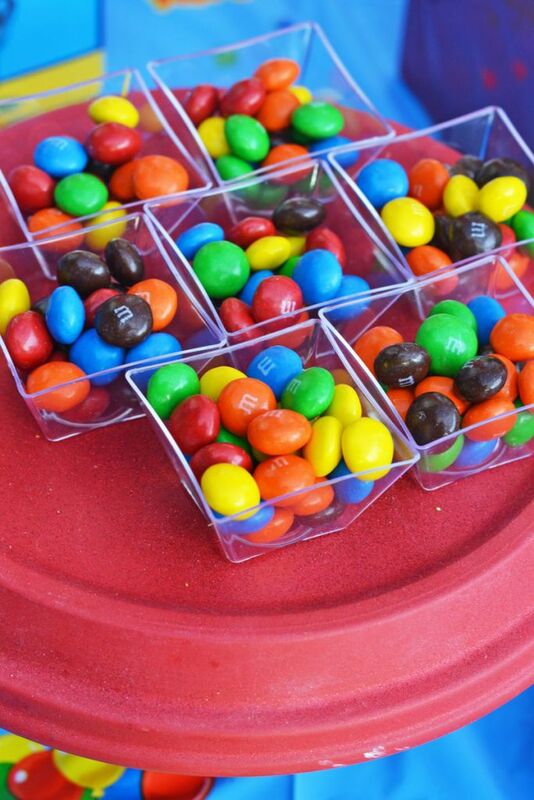 Another easy and fun treat is to add chocolate candies or M&Ms in little clear serving cups. 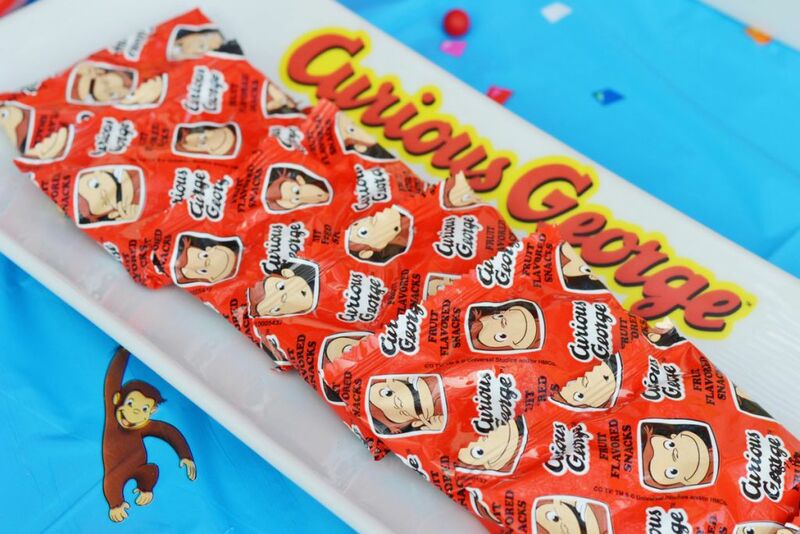 Curious George also has a line of licensed fruit snacks that you can buy at most grocery stores. 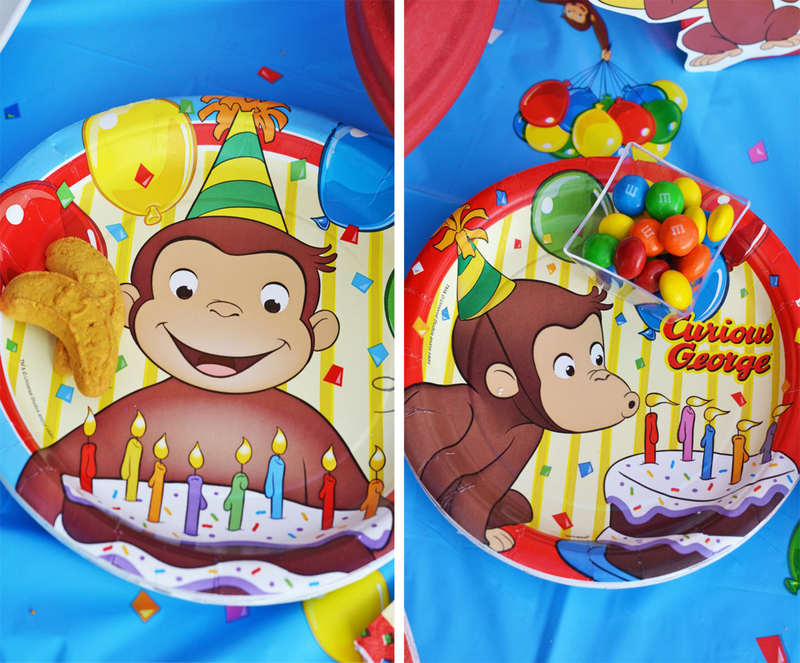 They are the perfect addition to any Curious George party and they make a great favor too! All these treats can be bought for under $50 total. 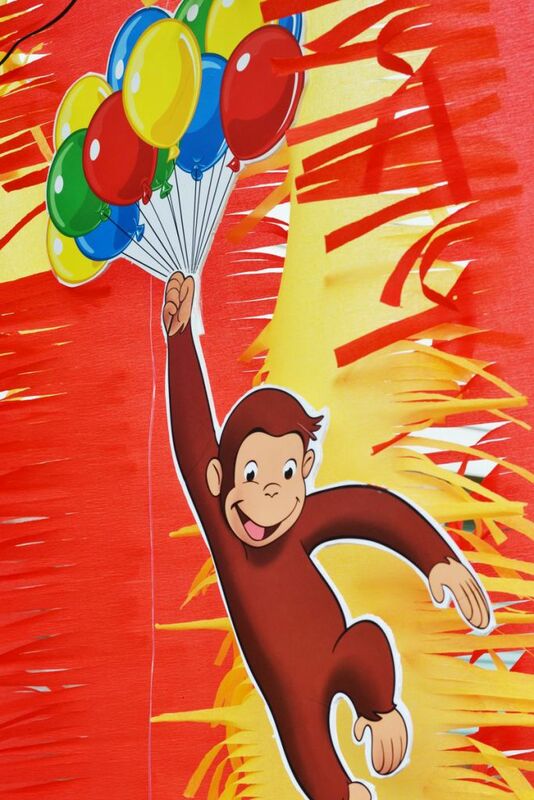 I also used some of the large Curious George wall decals and added them to foam board to make this Curious George who looks like he flying away from the table with a big bunch of balloons. I also used some of the smaller decals to add to the favor boxes. 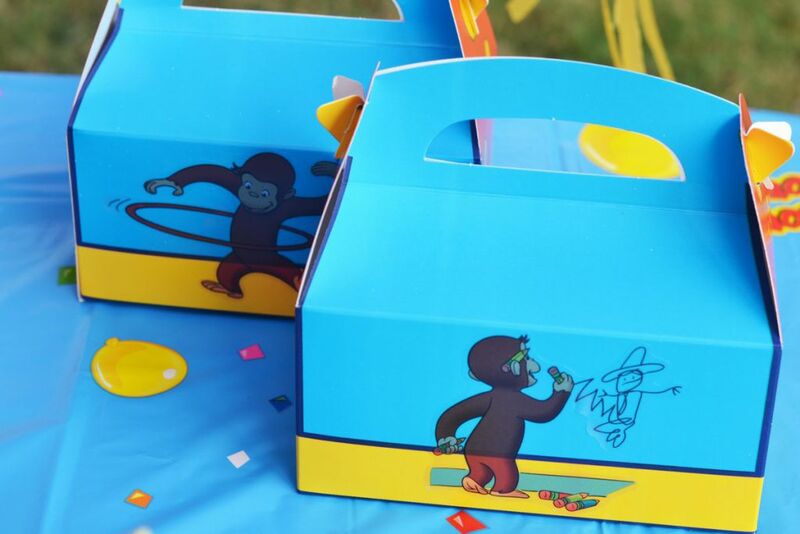 These favor boxes come with adorable little monkey finger puppets, coloring books, crayons, and bubbles. I also added one of the decals to a big red “G” (for George!) as part of the table decorations. I also put one on the plate with the fruit snacks too. 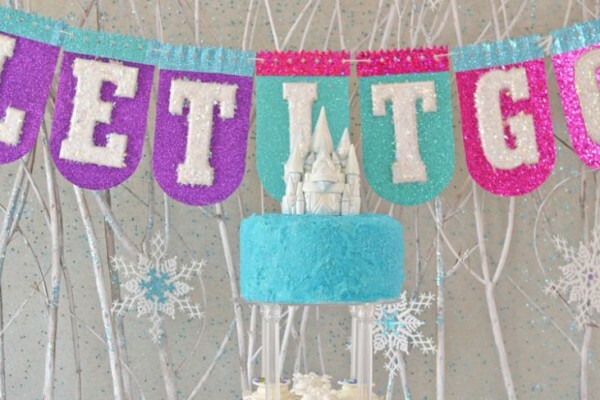 There are a ton of ways you can use these decals to personalize your party. Check out this cute collection on Birthday Express today! 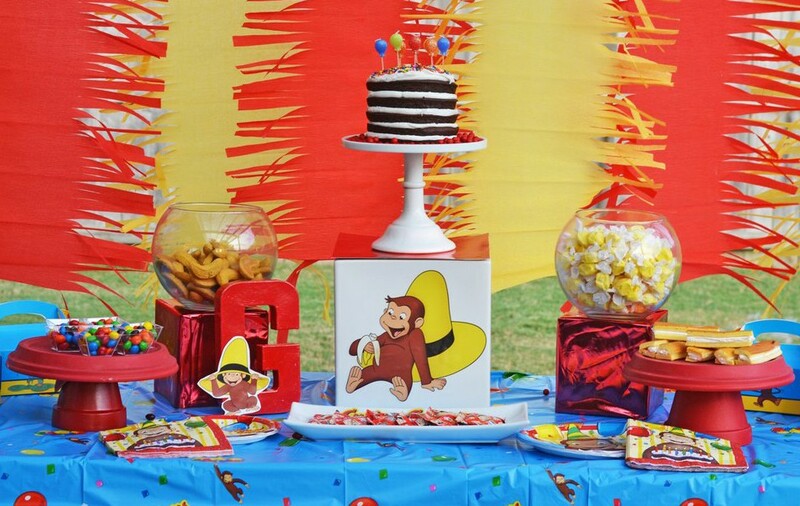 Did Brittany inspire you to throw a perfect Curious George party for your little monkey?